The Wire centres on a rag tag police task force working together to bring down drug kingpin Avon Barksdale (Wood Harris) in order to free the city of Baltimore’s “Projects” area from his vice like grip. A one sentence summary cannot hope to give justice to the dense and compelling story that is The Wire. This is not the black and white, good buys bad guys cop drama we are used to seeing on television today. The good guys aren’t always good and the bad guys aren’t always bad. Indeed perhaps the biggest roadblock the team must overcome is not the likes of Avon Barksdale but the politics of the police department itself, keen on self preservation even to the detriment of the city it claims to protect and serve. The Wire has a documentary feel to it in that it actually feels like you are watching events in real time, helped along by the fact that there is no score, no musical cues clueing you in to the emotions of the characters; a very conscious choice according to the creator commentary. 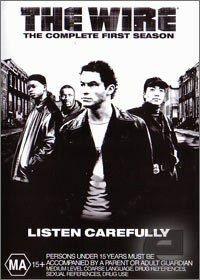 All the characters, on both sides of the law, are given real and complex personalities through solid writing and fine acting from an outstanding ensemble cast; Domini West (as Jimmy McNulty), Sonja Sohn (As Shakima Greggs), Lance Reddick (as Cedric Daniels) and Larry Gillard as (D’Angelo Barksdale) particular standouts. A warning to those with delicate constitutions, The Wire contains graphic violence, moderate drug use and a whole lot of swearing. The first episode alone is very off putting due to the amount of swearing it contains. However the coarse language does lessen to an extent in following episodes, that or it is less noticeable the more absorbed into the story you become. Bonus features for The Wire Season 1 are an episode index and 4 audio commentaries on key episodes. The commentary’s feature creator Ed Simon, director Clark Johnson and writer George P. Pelecanos who provide interesting facts about the making of the show, and its origins in real life; notably many of the characters are based on real world counterparts that series co-writer Ed Burns met during his time years in the Baltimore police force. Whilst informative it is best to leave listening to the audio commentaries until after you have viewed all 13 episodes as they do spoil plot points for both upcoming episodes and to a lesser extent upcoming seasons. The Wire seems almost tailor made for DVD. I can’t imagine having to endure watching this show chopped up by censors, and interrupted by commercials on free to air television. The story is so dense and so involving it would be very hard to keep up with it week to week. As commented on in the audio commentary The Wire is more a novel than a television show, each episode building on the last to create a whole greater than the sum of its parts; it is rewarding television of a high standard. Immersive and rewarding; television at its best - 4 out of 5 stars.